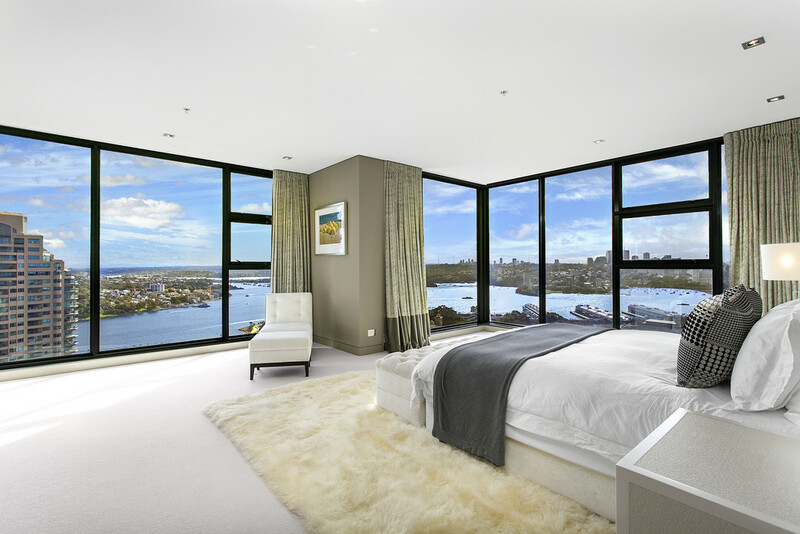 A three-level, four-bedroom luxury penthouse in the celebrated Stamford Residences is ​for sale through Michael Lowdon of Ray White Residential. This four-bedroom penthouse in Sydney's Stamford Residences has been professionally styled and furnished, allowing its new owners to simply walk in and enjoy the very finest city lifestyle. The penthouse has harbour views from every level. The 598 square metre floor-plan offers vast living options, with formal and informal living, separate media room, extensive connoisseur's kitchen, and both formal and informal dining areas. The master bedroom is situated on the top floor, and includes a lavish bathroom with freestanding curved frameless glass shower, and substantial walk-through wardrobes. Stamford Residences were built five years ago, and quickly came to represent excellence in all aspects of city living. The building was developed by Stamford Land Corporation, and designed by renowned architects Kahn Finch Group. The building's perfect location, superior build, and excellent facilities mean Stamford Residences are considered some of the most sought-after homes in Sydney. The apartment has been professionally styled and furnished, offering the opportunity for the prospective buyer to walk in and start enjoying immediately. Stamford Residences are located in the heart of Sydney's historic Rocks district, amongst new Sydney landmarks Barangaroo, 1 Alfred Street, and The Opera Residences in Macquarie Street. It is widely acknowledged in the industry that over the past two years the premium apartment market in Sydney's CBD has changed beyond recognition. Stamford Residences is very well placed to offer an outstanding city experience at perhaps a fraction of the price of its more expensive future neighbours. Stamford Residences is within walking distance to Sydney's most iconic landmarks including Circular Quay (approximately 550 metres), Sydney Opera House (approximately 1.3 km), Sydney Harbour Bridge (approximately 450 metres), and the Royal Botanic Gardens (approximately 900 metres) plus world-class restaurants and shopping. This penthouse offers the chance for a well-informed buyer to acquire a breathtaking home in a truly world-class building and location. This property is for sale through Ray White Residential CBD for $18 million. View Michael Lowdon's profile on Luxury List. View 28A/171 Gloucester Street, Sydney on Luxury List.